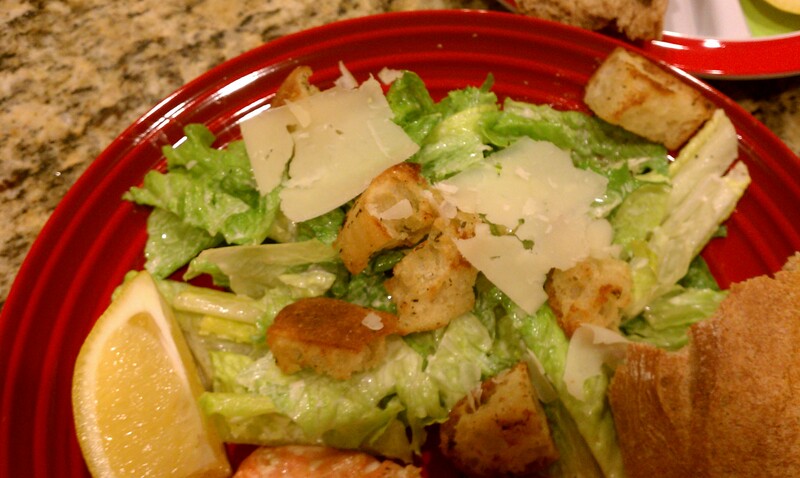 I love a good steakhouse-style caesar salad. And buttery homemade croutons just seal the deal. My wonderful sister-in-law gave me Allison Fishman’s cookbook, “You Can Trust a Skinny Cook” for Christmas, and I have since been drooling over her Caesar Salad with Garlic and Herb Croutons recipe and contemplating whether I’m willing to try cooking with anchovies. I finally decided that anchovy paste was a do-able starting point. It took me several shopping trips to actually find anchovy paste, so now I was really ready to try out this recipe. It was worth the wait — absolutely amazing caesar dressing with all the fresh garlic and parmesan, and equally amazing garlicky croutons.